Christmas time is genuinely unforgettable and unique impression everyone senses at the depth of a heart. The occasion brings us an all-hearted spiritual unification with Christ and so every single soul is willing to celebrate. Joyful Christmas-tree decorations and sparkling lightings, underneath boxes with presents, magic odours and Christmas cuisine tastes – all make up a magical celebration atmosphere indulging children and adults within the wonders of a Christmas night. Jingle bells are magically ringing while miraculous horses are dashing through the snow. The Holy Spirit is flying in the frosty air warming people’s souls with hope and joy. And no-one can be left aside at Christmas Time foe everyone is cheering with joy, singing carols and glorifying Christ’s mercy. 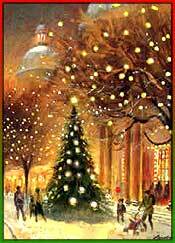 On Christmas night all wishes come true and so the celebration is special. Main meals and desserts taste as never again during a year-time, houses are carefully decorated with a special attitude from each member of a family. Outside things are no less miraculous - the entire atmosphere recalls a fairy tale. Everyone makes wishes through frosty windows, while enjoying falling snowflakes, sparkling stars above the darkness. All sorrows and regrets are forgotten and forgiven as on Christmas Night Jesus mercifully forgives every one of us. Joyful and spiritual Christmas time is a period of family unification and so each family member expresses a particular attitude to his/her relatives. Only then with the first star in the sky our wishes come true, we hold our hands in prayer celebrating together with Jesus and the whole Christian world! Only then it is right time to say - Merry Christmas to You! On this particular occasion we hold special senses to Jesus and each other – and so the joyful atmosphere is mutual; we feel it, cherish it, and certainly promise to make this world a better place and our living within to gather anew at a Christmas table in a year time, and say Merry Christmas! Cherish the joyful spirit of Christmas Festival with these heartfelt and reflective essays on Christmas! We also invite you to share your feelings and expereinces on Christmas by sending us Christmas Essays written by you. Your essay will be posted on this page along with your name!! Just before the last day of school I give out presents to my teacher and a few of my friends. I always hope they like what I get them. When school is over and the Christmas holiday begins I usually go out with my parents. During the day I go to Spain; maybe to a river or sometimes we just go on a ride round. Almost everyday we go out for lunch. I always ask my parents not to tell me what they get me. Of course I no longer believe I Santa Claus. They usually buy a present for my brother to give to me, as my brother is five. What I do is have my supper and then we each go to our beds. My favourite part of the holiday is Christmas day. Last year, I went down very early but my mother always tells me to wait for the rest of the family. When they come down I open my presents and every year I like what every one gets me. At night we have a roast dinner usually chicken. During January and February My brother and I get another present from my uncle from Australia it's usually clothing or sometimes jewellery. Two years ago I went to church on Christmas Eve and I won all the figures for the crib; there were all sorts of things. It was like the whole town of Bethlehem. Last year and this year, my father built a mountain that is about a metre wide. It starts small with bits and pieces and from there we build up. I live with my mother, father, brother and uncle and every year we have a nice Christmas. We are all happy and we get lots of gifts. My friends Kelly-Ann and Karess always get me a nice present and I always give them one too. Last year I gave Dr Ocana my teacher some figures to do a crib in class. Every year I give Christmas cards to all my friends. I love to decorate my house and last year I made a holly wreath out of a clothes hanger, some tinsel with a few decorations too. Christmas to me is a celebration, which includes spending time with my family, decorating the entire house, inside and out, and shopping, for the people I love. Doing this with the people I love is what means the most to me. Spending Christmas with my family is very important to me. We usually gather and celebrate at my parent's house, in East Tennessee. My husband, our three children, and myself travel from California. My two sisters, their husbands, and children come from a nearby town, for our celebration. We spend the day baking cookies, making fudge and preparing a big Christmas dinner, with all the trimmings. The children love to see each other. They spend the day playing games and sharing their new gifts and toys that Santa Claus brought for each of them. They get so eager to decorate, that it is hard to restrain them. Decorating for Christmas is so much fun. My father always draws a new background scenery, for the Nativity scene, that he displays, every year. He, my brother-in-laws and my husband start with the decorations for the outside of the house and the front yard. Every year, my parents add a little more to the outside decorations. My mom, sisters, our children and myself decorate the inside of the house. My mom has so many indoor decorations that they can not all possibly be displayed. We try to change the decorations, which we put out every year. The men finish up just about the same time as, we women and then it is time to decorate the tree together. The children love this the most. The tree is always real, and is usually six to seven feet tall. Most of the ornaments have been collected over the years and are very old. They have become real family treasures. We all have a favorite one that we each put on the tree. All the children put their First Christmas ornament on the tree, that I brought, as a gift. I am not usually a shopper, but during the Christmas season, I actually enjoy shopping. I rarely go into department stores, but during the Christmas season, I love to shop. The stores are so beautifully decorated and very festive. I can easily get carried away, with spending so much money. I must admit the thought of spending too much money hardly comes to mind. I can just picture of look on the faces, of my family and that brings me so much joy. I feel so fortunate, to have my family throughout the year, but especially, at Christmas time. When showing, my family just how much I love them and what exactly they mean to me. That is so very important to me. Christmas, for me is about being with family, loving each other and showing each other just exactly how we all feel. It is hard to believe that there is anyone on the planet who is not familiar with the story of A Christmas Carol. Written in a six-week period in October and November of 1843, the novel was the first of five short Christmas books published by Charles Dickens. Obviously, it was the most successful novel in the series. In fact, he was so certain that people would like his story that he refused to sell the rights to his publisher and instead paid to publish it himself. His instincts proved correct, and soon after its publication all of the copies were sold. In his later years, Dickens would read an abridged version of A Christmas Carol at public readings for which he charged a fee. Often, that fee went to the several charitable organizations that he was involved with throughout his lifetime. The book itself was instrumental in raising people's awareness of poverty. Since its publication, the story has been told many times in all imaginable forms. Despite the thousands of times that A Christmas Carol has been adapted to stage, radio, movies, and television, the novel remains the most popular and poignant telling of the tale. First, let's return to the shadow of the cross. Because the life, death and resurrection of Jesus make up the foundation of Christianity, the Christian community has long reflected on their significance for our lives. What was the purpose of Jesus' life? Or simply, why Jesus? The answer most frequently handed on in everyday religion emphasizes redemption. This view returns to the creation story and sees in Adam and Eve's sin a fundamental alienation from God, a separation so profound that God must intervene to overcome it. The Incarnation, the Word becoming flesh, is considered God's action to right this original wrong. Redemption, then, is basically understood as a "buying back." Certain rites and passages (the suffering servant in Isaiah, psalms of lament, wisdom literature on the suffering righteous person) seemed to fit the terrible events at the end of Jesus' life and so offered an answer to the why question. Understandably, these powerful images colored the entire story, including the meaning of Jesus' birth and life. Throughout the centuries, Christian theology and piety have developed these interpretations of Jesus' execution. At times God has even been described as demanding Jesus' suffering and death as a means of atonement-to satisfy and appease an angry God. In many forms of theology, popular piety and religious practice, the purpose of Jesus' life is directly linked to original sin and all human sinfulness. Without sin, there would have been no need for the Incarnation. Christmas is a celebration of Jesus Christ's birth. Some people celebrate Christmas differently, but it is all based upon the birth of Christ. Christmas is on December 25th. This is the day that Jesus is said to be born. Nobody really knows the exact date Jesus was born. Yet, in 137 AD, the Bishop of Rome ordered the birthday of The Christ child be celebrated as a solemn feast. In 350 AD, another Roman Bishop named Julius I, choose December 25th as the observance day of Christmas (The Mass of Christ). People celebrate Christmas differently form one another. For example, my family celebrates Christmas by decorating our entire house. We also exchange gifts, go to church, and cook a big dinner. Even though we do all these things, we remember the "true" meaning of Christmas - To Celebrate the Birth of Jesus Christ. On the last day of school, I always give out Christmas presents and cards to my teacher and my friends in class. We always have a party the last day of the term and we play games. When school is over we usually go down town and finish our Christmas shopping. Then we go home and have our dinner and we go to bed. The next day we go down town as it is Christmas eve and we see all the Christmas lights and there is always carol singers on the street. We sometimes meet our friends and go for coffee. At around 6 pm we go home to get tea for our dad. When he comes home we open some presents that our friends have given us. At 9 we go to mass and when we go home we get our snacks for Santa ready. The next day is Christmas day. At 9 am we get up and we go downstairs to take the goodies Santa has left for us. At 12 we go to our granny and grandads house for few hours and then we go home. At 2 some of our relations come over and we get some more presents. At 7 we go for a walk around town and when we come back and we get ready for bed. We have a drink and we go to bed.